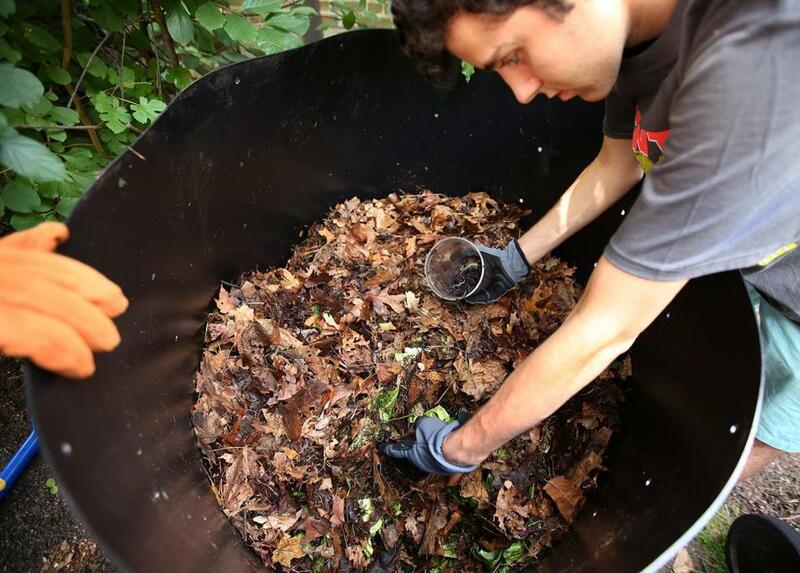 Grant Berman adds red wiggler worms, which he breeds in his basement, to a leaf-and-cabbage composting mixture. Concerned that they wouldn’t be able to find a summer job together, Grant Berman and Max Mackenzie, sophomores at Newton South High School, decided to create their own in spring 2014. With Mackenzie at a different school this year, 17-year-old Berman is now sole owner of Dirty Boys Composting in Newton. Together with honors biology study partner Miles Macero, he installs, evaluates, and maintains backyard compost piles (complete with red wiggler worms grown in his basement) while teaching best practices as a home composting coordinator for the Massachusetts Department of Environmental Protection. Q. How did you settle on composting as your business? A. Our parents told us that recycling was the big thing when they were growing up, but it hadn’t fully caught on yet. We thought composting had the same [growth] potential. Q. Why should people compost their kitchen and yard waste? A. When you compost nutrient-dense scraps, they break down into a soil enhancer that helps you show off your lawn and garden to your neighbors. For me, though, keeping all that organic material from going into the landfill is the main benefit. I’m not a very avid gardener, but I want to save the environment. Q. Do you spend a lot of time educating customers? A. Most people know the basics, like not to put in animal products, but there are still many misconceptions. They worry the food scraps will smell as soon as they hit the compost pile, which will attract a zoo in their backyard. If you’re composting correctly, though, there won’t be any smell or pest issues. As for maintenance, you only have to go out once a week to water the bin and turn the soil over. A. We advertise at farmers markets in Newton, Waltham, Lexington, Needham, and Natick. Right now I have 70 customers, who are diverting 100 tons of compostable trash each year from the waste stream. That’s 11 garbage trucks full of organic waste, which is saving the city governments money on trash hauling services. Q. What are your plans for the business when you go to college? A. I mainly work with clients in the spring and summer, when I’ll be home from college anyway, and I can do marketing on social media from my dorm room. I didn’t realize at first how well-suited this business is for a college kid. It’s lucky for me. For more information, visit dirtyboyscomposting.com. Cindy Cantrell may be contacted at cindycantrell20-@gmail.com.